The PTR-2000 Plasma Trimming Rod™ is an accessory for any plasma cleaning system to remove damaged surface regions from FIB and ion milled TEM samples using low energy ions. It utilizes the plasma as the source of ions and external biasing for extracting the ions from the discharge. The geometry of the holder and sample creates the proper electric fields that cause the ions to deflect towards the sample at relatively low angles. With the appropriate adapter, the PTR-2000 can be used with any plasma cleaner. The PTR-2000 is programmable with up to four steps with voltage values between 0 and 500 V and 0-24 hours each. It has been well documented that low energy plasmas can be used to reactively etch or remove organic materials found on the surface of inorganic materials. This technology has been used by the industrial community to clean semiconductor wafers and optical materials for many years. A related technique is now being implemented in the field of electron microscopy, where specimens can become contaminated during the preparation process or from other sources. 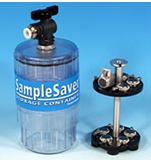 Current analytical instruments use tightly focused, intense beams that create carbon deposits on the specimen surface due to organic contamination. The PC2000 is designed to simultaneously clean the specimen and specimen stage, which minimizes, and in many cases, eliminates contamination of the specimen being analyzed. The specimen holder and specimen are subjected to reactive gas plasma prior to electron microscope analysis. 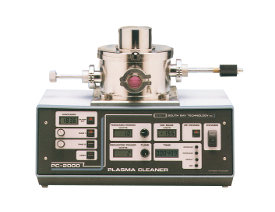 The PC-2000 Plasma Cleaner allows simultaneous cleaning of a specimen and a specimen stage which minimizes and, in some cases, eliminates contamination of inorganic specimens analyzed via SEM, TEM, STEM and/or AEM. The technology involves subjecting the specimen and the specimen stage to a reactive gas plasma which efficiently removes a wide range of contaminants from critical surfaces. The procedure may be carried out prior to inserting the specimen and specimen stage into the EM by either mounting the specimen holder in the supplied port or by inserting the entire sample or sample assembly through the hinged upper port and into the 8” diameter x 4” high chamber. 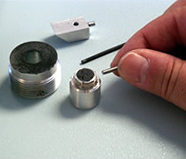 The system can be used with any side entry TEM holders, top entry TEM holders or with any sample that will fit inside the large, easily accessible chamber. risk of etching the specimen stage or the chamber Viewport allows easy monitoring of the process. Safety interlocked controls simplify operation - ideal for multi-user environments.